haven for weekend or holiday with family or friends. Rest, peace and relaxation you will be provided in this spacious and comfortable cottage. Stayed here for a week in August with our extended family and it was absolutely wonderful. Beautiful gite in a brilliant location! Max and Aline keep the property to such a high standard and couldn't do more for us while we stayed there. The pool was brilliant for the 4 children and we were very content just staying by the pool for days. Cloyes, the neighboring village, is extremely beautiful and has plenty to offer. 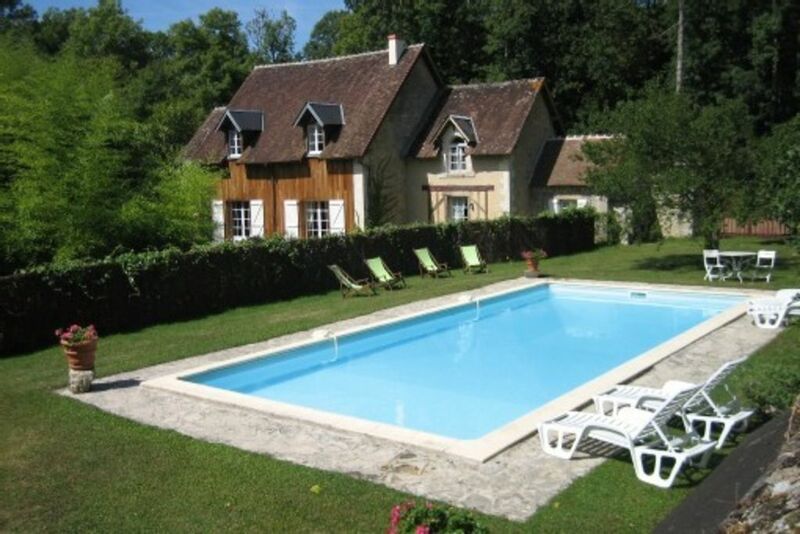 The location of the Gite means that you can travel to many surrounding attractions easily. I would highly recommend this property and will hope to return in the future. Thanks very much dear Gareth! What a special place this is!!! As soon as we arrived we felt at home, the cottage itself is very spacious and decorated very well, what's also great is that the house remains very cool even during hot weather. The bedrooms and storage are excellent with separate bathrooms should you need to use them as well as offering a double ensuite bathroom on the ground floor location (but away from the living area). The garden is huge and private, it boasts a bamboo forest for kids to play in. There is a table tennis table, but we didn't get chance to use this as the kids spent most of the time near the pool, which is secured by a fence and security code to enter the area. Max and Aline who own the property live in the Chateau located behind the cottage and are very hospitable, they made us feel at home and are genuinely very nice people who want to make sure you have a great holiday. The area itself is close to a number of tourist spots, but we spent most of the time near the pool, the villages nearby offer shopping etc and there are a number of supermarkets less than 5 miles away. In short we had a great time, and we will be going back....I would definitely recommend to anyone. Perfect holiday cottage in an idyllic setting! This place met most of our expectations, and exceeded the rest. A beautiful cottage, renovated really nicely inside, and set in unspoiled woodland. And with the pool fenced off from the rest of the large garden, a very safe place for children. We spent two peaceful weeks here, and hope to return. The pictures really don't do it justice. It's a wonderful place. Aline et Max sont visiblement des gens généreux qui ont su aménager une très belle chaumière, vaste (5 grandes chambres, quand même), agencée de façon très pratique (rien ne manque) et avec beaucoup de goût. La "pièce à vivre" est vraiment grande et se partage naturellement entre salle à manger (10 à 12 p) et un salon confortable. Une grande cuisine où il fait bon prendre son petit-déjeuner (si il fait froid dehors). Une mention spéciale à la chambre du bas qui donne directement sur le jardin ... ! Nous avons pleinement profité des aménagements extérieurs, en particulier de la piscine (quasi olympique !) mais aussi du pré avec sa bambouseraie centrale : Ping-pong, molki, pétanque, tout est possible tant l’espace devant la maison est vaste. Enfin, nous avons eu la chance de rencontrer Aline qui est une hôtesse très souriante et chaleureuse, nous la remercions encore pour son accueil. Bref, il faut revenir car pourquoi ne pas visiter les alentours ? j'ai été très heureuse aussi de vous rencontrer. et ce sera avec grand plaisir de vous revoir ! Le temps étant propice nous avons pleinement profité de la piscine. Propriétaire disponible, discrète, en un mot, professionnelle à tout point de vue.